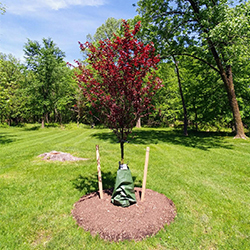 We are pleased to share with you photos of the trees purchased and planted on the ACO campus this spring thanks to the generosity of our supporters. We look forward to seeing these new trees grow and thrive and to planting the remaining shade trees from Phase I in early spring of 2019. 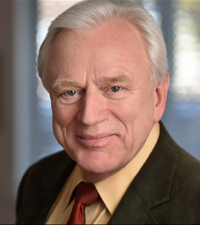 We will be announcing Phase II of the Project next year, but in the meantime if you wish, you may make a donation to the Living Campus Fund below. With the first days of autumn now upon us, I am excited to tell you about our new ACO Living Campus Project. As you may know, over the past several years we have made an incredible amount of progress improving our Princeton campus by removing “detractors” (old outbuildings, swimming pool, tree stumps, brush, etc.) and making improvements. 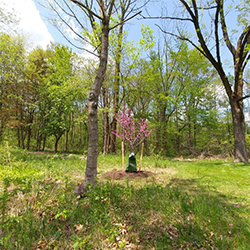 After much hard work, we are thankfully now at the point where our property is looking shipshape and we can begin adding “attractors.” What better way to start than by adding new life to our landscape with trees? Early autumn is the perfect time for us to remove several old and unhealthy trees on the property (the last of our “detractors” - see photos of removal in process) and replace them with new ones that will grow strong and grace the landscape for generations to come. We have already begun planting new trees with the future in mind. As you can see, our two Red Sunset Maples planted in 2016 are thriving and will bring much enjoyment thanks to their shade and brilliant fall colors in the years to come. Option 1 - General Contribution - Give a general contribution to the project, which will be put toward tree purchases and expenses. Any donation, no matter the size, makes a difference. Option 2 - Select a tree - Select your favorite tree from the list below and contribute the listed amount. 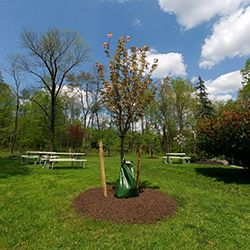 At the time of planting on the ACO campus, a permanent marker will be placed next to the tree stating the species and year planted, along with your name as donor or, if you wish, the tree can be dedicated to or planted in memory of someone. Our office staff will be in touch with you regarding the wording for your marker. It is only with your generous help that we can continue to make strides in improving our campus and sharing what we have to offer to the world. The ACO is a 501c3 non-profit organization, and all donations are tax deductible. You may send your contribution to us at the address below, call our office staff at (732) 821-1144, or donate or select a tree below. If you prefer, please call our office staff and they will be happy to assist you and answer any questions you may have about our Living Campus Project. I hope to see you in the near future at one of the many events at our home and that our ACO Living Campus project will “bear fruit” so that you will be able to enjoy these beautiful trees with us in the spring. Make a general contribution to the ACO Living Campus Fund, which will be put toward tree purchases and expenses. Any donation, no matter the size, makes a difference. Call (732) 821-1144 or contribute securely online by clicking the button directly below. 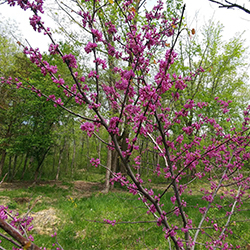 Known as the harbinger of spring, the Red Bud’s delicate blossoms and buds are one of the season’s most dramatic displays. Unique and irregular branching patterns combine with a trunk that divides close to the ground to create a handsome, spreading crown that is stunning in winter when covered with snow. Height at maturity: 25 to 30 ft. 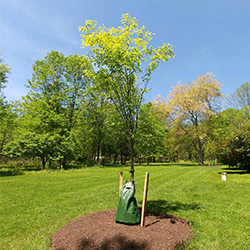 Cost $575 (includes purchase of 8 to 9 ft. tree, professional planting, one-year guarantee, and permanent tree marker with inscription if desired). Our thanks to our supporter who purchased the Red Bud. 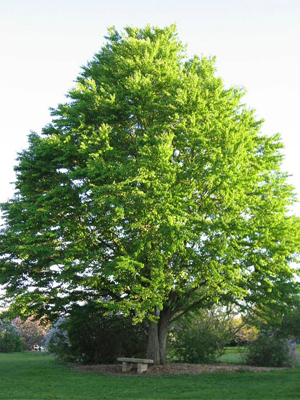 The Japanese Zelkova is a shade tree with an appealing vase-shaped form and a rounded crown. Its green leaves turn yellow, copper, orange or deep red to purplish-red in fall, putting on a showy display. Height at maturity: 50 to 80 ft.
Our thanks to our supporter who purchased the Japanese Zelkova. 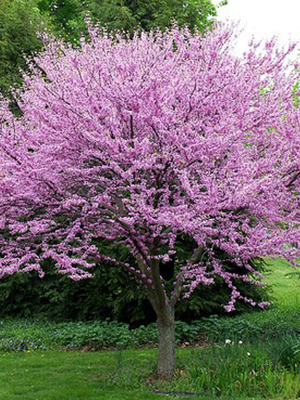 The Thundercloud Plum adds a splash of beauty to the landscape with its beautiful pink and white blossoms in early spring and rich deep reddish-purple leaves in summer. Height: 25 to 30 ft. at maturity. Our thanks to our supporter who purchased the Thundercloud Plum. 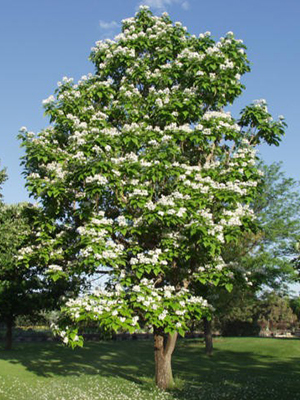 The Northern Catalpa commands attention with its white, showy flowers, giant heart-shaped leaves, dangling bean-like seed pods and twisting trunk and branches. 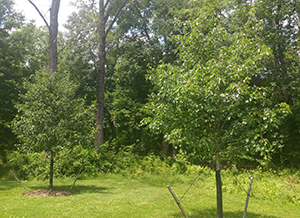 Height at maturity: 40 to 60 ft.
Our thanks to our supporter who purchased the Northern Catalpa. 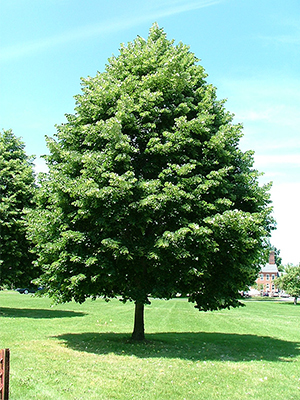 The Silver Linden is a beautiful shade tree with smooth, light gray bark, fragrant clusters of yellow-white flowers and yellow autumn color. Its leaves are a deep, radiant green on top and silver beneath. In even the slightest breeze, the canopy appears to shimmer. 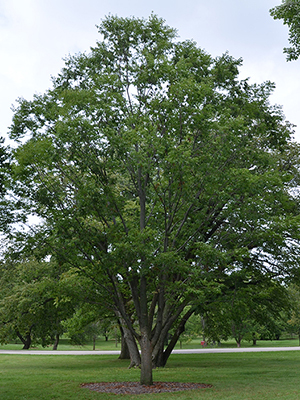 Height at maturity: 50 to 70 ft.
Our thanks to our supporter who purchased the Silver Linden. 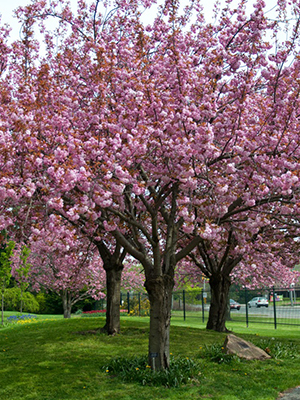 The Kwanzan Cherry is the showiest of all double-flowering cherry trees with its stunning pink blossoms and brilliant autumn colors that start out yellow and turn orange. Height: 30 ft. to 40 ft. at maturity. 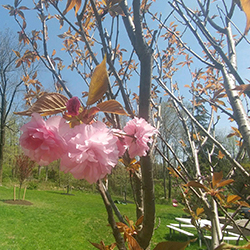 Our thanks to our supporter who purchased the Kwanzan Cherry. The Katsura tree makes an excellent specimen or shade tree with foliage offering an array of color throughout the year. 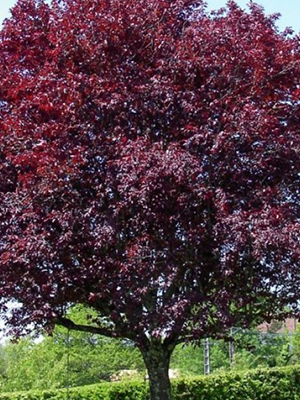 In spring, heart-shaped leaves emerge reddish-purple, changing to blue-green as they mature. In autumn the color display changes again as leaves turn clear yellow or apricot color. Height at maturity: 40 to 60 ft.
Our thanks to our supporter who purchased the Katsura.